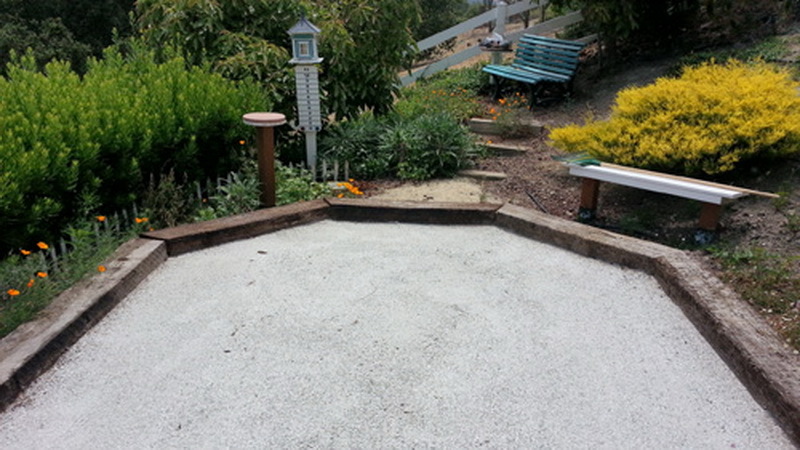 Steve Pollack shares some of his photos of his unique octagonal bocce court. This nice looking court is in beautiful California. It surely is a great looking court from one of the most innovative guys in bocce! 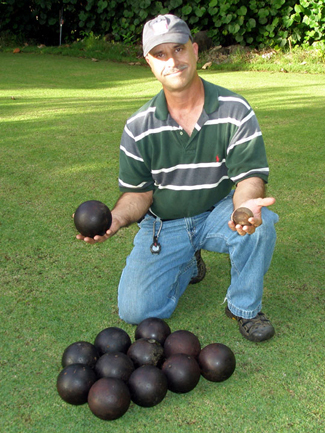 Can you help Dr. Joe identify these Bocce balls? 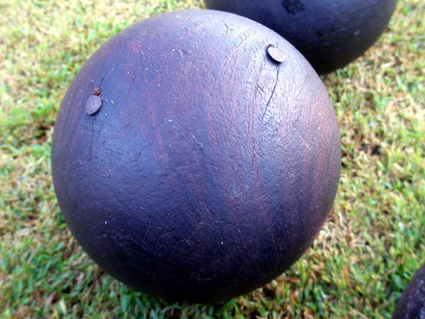 “1) Can anybody describe the proper method to restore these balls to their original condition? 2) Should they be altered at all? 3) What is the purpose of the nail heads? These bocce courts were sent to me from some Bocce enthusiasts from around the United States. It features past Joy of Bocce Weekly photos highlighting popular bocce venues. Special thanks to all those that sent us your photos. Click the photos to see more in the series. The Griffin Country Club in Georgia looks like a great place to play. Grass courts look like they play like putting greens. Photos by George Danner. Looks like a great court and not too far from me. I’ll try to get my bocce posse to challenge the Gravallese clan to a match. Lou Ures’ 80′ by 11′ Forest Court in Florence, Oregon. It features a crushed oyster shell topping. Lou’s great court and bocce gatherings have drawn the attention of local media. The Stone wall is a nice touch. The playing surface is a 3-inch deep “infield mix” — 10% clay, 20% silt, and 70% sand, over the sub-surface of crushed stone. These people are surely spreading the Joy of Bocce. Thanks for sending us your pictures. If you are going to play exclusively on grass, try to avoid the smaller object balls. Small pallinos tend to be obscured even by closely cropped lawns. We often use a croquet or field hockey ball as the target ball when playing on grass. Sizes are usually metric and designate the ball’s diameter. You’ll see pallinos that are 40 mm to 60 mm in diameter (40 mm will be lost in the grass, 50 mm or larger is better for lawn play. A field hockey ball is about 70 mm). They come in all sizes – the one to the far right is a field hockey ball (white in color) that we use on grass. You can usually see that one even if you don’t mow the lawn. One pallino that is catching on is made of stainless steel (second from the left in the photo above). It is 40mm in size and 280 grams. Because it has a lot more mass than more traditional pallinos, the stainless steel target doesn’t get knocked out of the court by a hard hit. This makes for a lot safer game for players and spectators. Visit DaVinciBocce.com for stainless steel pallinos. 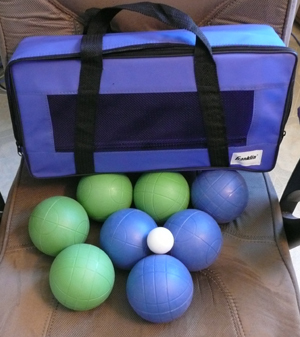 As with object balls, you’ll find bocce balls of varying sizes and weights. First off, the game is not originally an American one. The specs are generally metric. In international competitions, the standard is 107 mm and 920 g. The 107 refers to the diameter of a ball and the 920 is its weight (mass). From what I understand of the process, it takes high grade plastic to manufacture balls to these specifications. Top players tell me that they prefer Italian made balls, indicating their belief that they are manufactured to greater tolerances. The 107 mm and 920 g specs are those observed in true World Cup and international play. Italian manufacturers like Perfetta, Super Martel, and Salf, almost always supply the balls for these events which may be held anywhere in the world. Recently, with the opening of fabulous venues like the Palazzo di Bocce in Michigan and Campo di Bocce in California, the USA has become an attractive site for world-class tournaments. 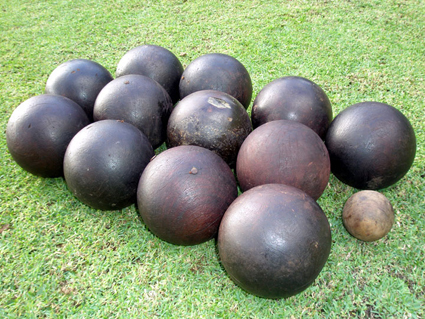 You’ll find bocce that are anywhere from 80 mm (might be good for children) to 115 mm (cannonballs). The weights vary just as much, with some approaching hernia inducing proportions. It takes extremely high grade plastic to get balls to meet the size and weight specs of international standards while maintaining the requirements for balance and roundness. These international specs (107 mm, 920 g) represent a good size and weight for most people. Small and light enough for even those with small hands to control. Why shouldn’t we use what the top players roll? I recommend that you purchase a set that is as close to these parameters as possible. First off, don’t be misled by the claims. One that we still see quite often is “Manufactured to International Bocce Association specifications.” I hate to break the news, but the IBA has been defunct for many years. The fellow that put that group together did a great job, but when he passed away, no one picked up the ball. Although he named his organization the International Bocce Association, I could find no ties to any international groups. Heck, when you establish an organization you can call it anything you want. You can set up a bank checking account under the name World’s Greatest Bocce Association. Print that name on your checks and you’ll be Doing Business As (DBA) World’s Greatest Bocce Association. There’s a big annual tournament in Rome, NY that organizers call The World Series of Bocce. It’s very successful and well run, drawing hundreds of teams from the USA and Canada. But teams are not flying in from Italy, Switzerland and other countries to make it a real “World” Series. The traditional colors for bocce balls are red and green, but there is no limit to the variation in color and design today. Years ago I played in the IBA’s World Cup (there were quite a few teams from the USA, but I don’t think the rest of the world got the word on this event). Held in the Imperial ballroom of Atlantic City’s Trump Plaza, tourney organizers got the American manufacturer EPCO to fabricate blue and white balls. They’re still for sale and billed as the EPCO World Cup Bocce Set. Note: if you will be playing with anyone who might be color-blind, you might want to opt for yellow bocce balls (if you can find them). If you had, say four yellow and four of any other color, the color-blind person could readily distinguish one team’s bocce balls from the other. 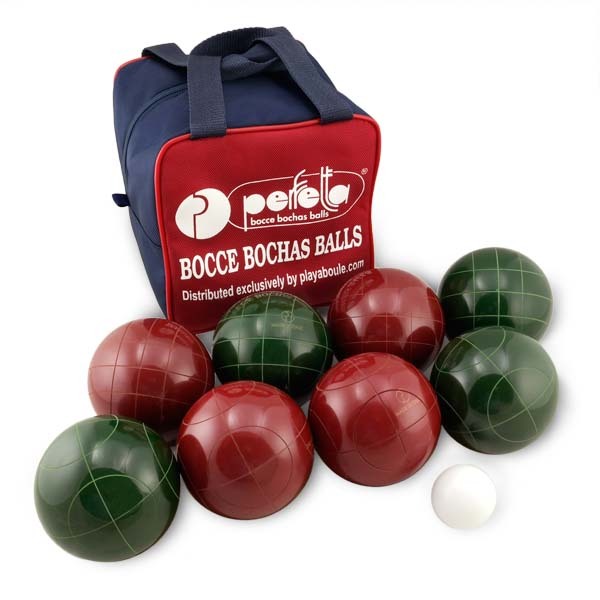 Note #2: some bocce sets come with 8 balls, but of four different colors. You might have two red, two green, two blue, and two yellow. So, if you were playing doubles (two players vs. two players) for example, you’d roll two balls each. 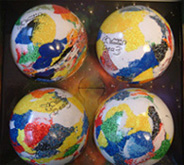 You and your partner might have the red and green balls, and your opponents would have the blue and yellow. I’m not crazy about the sets with four different colored balls. If you really want the set, maybe you could find someone else who also wants them – purchase two sets, then divvy up the balls so that each set has eight balls, but four of each of two colors. What does a set of bocce balls consist of? 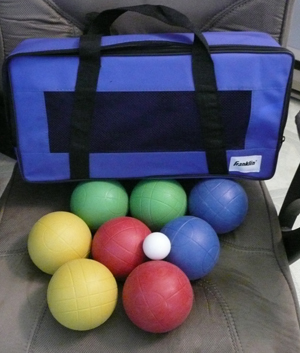 For most people, a set means eight bocce balls (four each of two different colors), a carry bag and a smaller target ball or “pallino”. Most often this would be four red, four green, a white or yellow pallino, and a carry bag. This high quality Italian-made Perfetta set comes with 4 red, 4 green, one pallino, and carry bag. Click the image above for more details and to purchase. 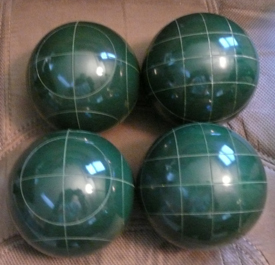 Often, the four red and four green bocce balls in a traditional set have lines or engraved designs to further differentiate each group of four into two sets of two. For example, in a doubles match you could tell which two bocce balls were yours and which two were your teammate’s. One teammate would play the balls with the circles and the other the ones with the squares. Careful – some of the more expensive European balls come four to a set instead of eight and don’t include a pallino (and metal balls are sold in sets of two). Really competitive players cart their personal bocce balls wherever they play. They want the consistency that using the same bocce balls every game brings. You’ll see them use a cloth or chamois to wipe dust and debris from the ball before each toss. Four-ball set from Italian manufacturer, Super Martel. What are these balls made of anyway? 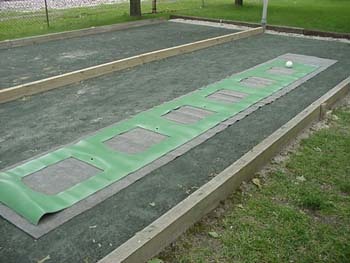 You can find inexpensive bocce ball sets in department stores that are made of wood or plastic. 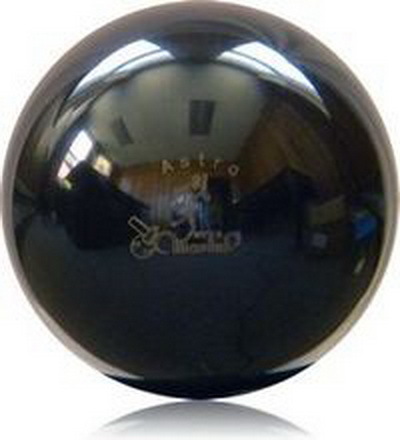 Not plastic like in a Wiffle ball, but like in a bowling ball or pool ball. The plastic is sometimes referred to as phenolic resin or partek resin. Let’s face it – the market in America is for inexpensive recreation bocce balls. Most Americans are nothing like the top European player who wants a new set of balls once his old set gets a nick or two. Still, even if you are planning on occasional use in the backyard after cookouts, I’d opt for a quality set that will last a lifetime over a bargain basement set. Click for Perfetta Club Pro set – solid colors red and green, 8-ball set, pallino and carry bag. Click for Perfetta Club Pro set – speckled colors red and green, 8-ball set, pallino and carry bag. CafePress offers coupon good for this week only! The new Joy of Bocce logo got rave reviews last week. I’ve uploaded it to my virtual storefront at CafePress.com, placing it on t-shirts, caps, mugs and other items. Please check out the finished product by clicking the link below. 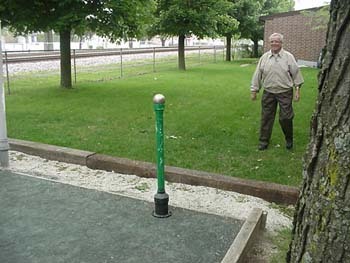 I’m hoping that t-shirts, teddy bears and other items proclaiming the Joy of Bocce will help build our subscriber list and promote the game of bocce. The more bocce fans we can reach, the more impact we can have in promoting and unifying this great game. You can click the images to go directly to the Cafe page. CafePress.com, the clever print on demand company is offering coupons for the very first time! Using a special coupon code, Joy of Bocce Weekly subscribers can receive $5 off their purchase when they spend $40 or more (not including shipping). Small holds 11 oz. ; Mega holds 20 oz. This offer expires in a week. Click the link below to check out dozens of items displaying the striking new Joy of Bocce logo. Enter the coupon code, PREZDAY, at checkout if your order totals $40 or more. P.S. I will check the cafepress and see if we can extend the discount for all our bocce aficionados. 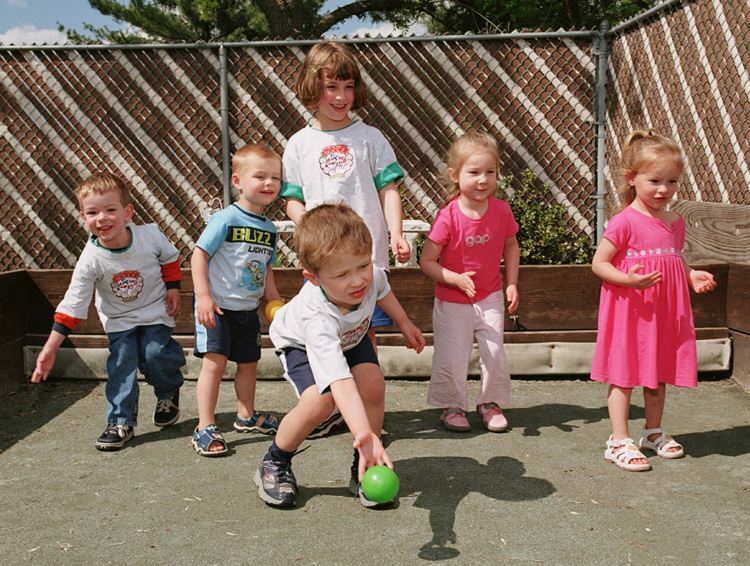 Thanks to all who answered last week’s request for suggestions for playing bocce with young children. Most cautioned us to watch out for errant tosses and for bocce balls dropped on tiny toes. Many recommended using smaller, lighter balls that could be more easily managed by little hands. All of this was good advice. Kids playing in our backyard bocce court. Still, there was the question of how we would actually introduce bocce to the tykes. After much thought we decided to model the same successful format we used previously with middle school kids (see Volume II, Issue 8 – February 24, 2003 – archived at JoyofBocce.com’s Back Issues link). First, I enlisted the help of many adults (bocce players, day care providers, parents), impressing upon them the need for “crowd control.” The event was well publicized and about 30 children (mostly 3- to 5-year-olds) showed up at Methuen’s Bridgewalk Family Resource Center. Dolli Pariseau oversees the center which offers a variety of free children’s programs and parenting services. Then, before sending the preschoolers off to experience the joy of bocce, we set the tone with some mood music (Frank Cappelli’s Bocci Ball). If you are unfamiliar with Cappelli’s wonderful melodies, you are in for a treat. Contact him at F.E. Cappelli Publishing Co., 717 North Meadowcroft Ave., Pittsburgh, PA 15216. We set up 3 sections of carpet on the gym floor and sent the three-, four-, and five-year-olds off to different areas. The older children played bocce games with regulation bocce balls and two-by-fours marking the court boundaries. Several of our Monday morning bocce players did a great job of organizing the games and instructing the kids. When the children tried to pick up two bocce balls at once, they dropped one or the other or both. So, we learned to roll the balls GENTLY, and one at a time, please! The younger tykes just practiced rolling balls. They used small, brightly colored plastic balls or special water filled bocce balls. It wasn’t certain that they understood the object of the game, but it was infinitely clear that they were having a blast! More properly called Rapid Progressive Volo Shooting, this is an event where target balls are placed on pre-positioned locations on mats located at each end of the court. 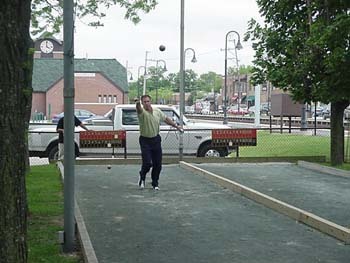 The contestant runs to the 7.5 meter line and lofts his shot at the target, and then runs to the other end, picks up a ball from a stand, and repeats the process back in the opposite direction. After the shot is released, the player runs to the other end of the court. There are six target spots on each mat located .8 meter apart. After each hit, the target ball is placed in the next position (.8 meter farther away). After the last target is struck, the targets are moved progressively forward and so on. The exciting event lasts 5 minutes. There he takes another ball off the stand and proceeds to shoot at the target at the opposite end. Note spotter. 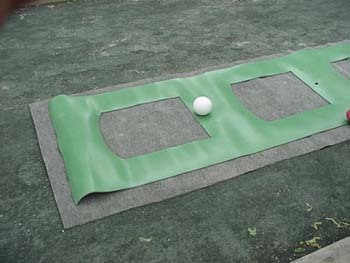 To recap, for this event a mat is used, upon which are placed target balls. As a player makes a good hit, the target is progressively moved farther back from one to six designated spots on the mat. When you hit the first target, a “spotter” places the target ball in the second position on the mat. This is the final target. There are six positions on each mat, and a mat at each end of the court. You have five minutes to run back and forth, hitting as many targets as you can within the time limit. It is ironic that, to the uninformed, bocce conjures up images of old, out-of-shape wine drinking, cigar smokers, while this demanding event rivals any cardiovascular endeavor one can imagine. 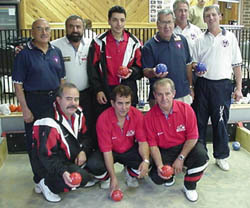 The following photos are from the 2002 North American Bocce Championship held at the Highwood, Illinois Bocce Club. A brief synopsis of play follows – for more info go to the Joy of Bocce Weekly back issue and click on Issue #40. Top players from the USA and Canada prepare to compete. These rules are for Punto, Raffa, Volo play – for the other style of International play (Volo), click on the Volo Play navigation button (to the left and below). International rules are much more stringent than we back-yard bocce players are used to, but the skill level and excitement is undeniable. This is the game that promoters hope to see in the 2008 Olympics in Beijing (the Chinese LOVE bocce and have the option of selecting a new sport when the games are held in their country). Players who want to hit another ball away must call their shots. The referee uses chalk to mark the positions of all balls and the pallino. You must call which ball you will hit and whether you will do so via raffa or volo. If you declare that you will raffa one ball and hit another by mistake, the Rule of Advantage applies. That is, your opponent can decide to let the play stand, or put the displaced balls back where they were, and remove the raffa attempt from play. If you call a volo shot, the referee traces an arc 40 cm in front of the ball you intend to hit. Your ball must land within that arc for it to be a valid hit. If not, the Rule of Advantage applies. If you hit the backboard without first hitting another ball, your ball is dead and removed from the court. You may not hit the sideboard. If you do, the Rule Of Advantage Applies. You must ask the referee’s permission to come down court to view the positions of previously played balls. Fail to do so and you forfeit one ball. These courts are 86′ by 10′. Note the heavy duty swing boards and the tiny pallino used in international play. Displacing another ball even when you are pointing can create a Rule of Advantage. If your ball taps another ball causing it to move a distance greater than the length of the tool (70 cm) the rule applies (with these fast-playing surfaces, it doesn’t take much of a hit to move a ball 70 cm). Moreover, if your ball moved the pallino just a short distance and caromed off to hit another ball and that ball moved more than 70 cm, the other team has the option of putting the pallino back to its original position, but the displaced ball stays put. Bersaglio – when a ball is within 13 cm of the pallino or when two balls are within 13 cm of each other a bersaglio exists. This means you can call your shot and hit either of the two balls to make a legal hit. The measuring device used in international play. This measuring device is 70 cm in length. There is a sliding section that can go down to 40 cm (shown here) to trace arcs for called volo shots and to 13 cm to check for bersaglio. See Joy of Bocce Weekly Issue 40 for details. Here is a three-and-a-half minute video of international punta raffa volo singles play where there happened to be no hitting, just pointing. Notice how gently the rolls are on the synthetic surface at Michigan’s Palazzo di Bocce. Two good players, Brian Polantz and Angel Cordano, match up in a duel of pointing. Brian Polantz starts off by rolling his first ball a little past the pallino. Dr. Cordano then rolls next and beats Brian’s point. Notice how the referee marks the positions of balls with chalk affixed to the bottom of the measuring device. When the referee holds the scoring device upright (perpendicular to the court surface), he’s telling the players that the last roll beat the previous point. Holding it parallel to the court surface means the point was not made and you must roll again. 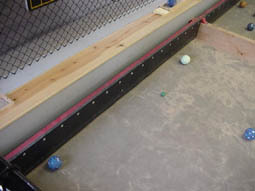 After Brian Polantz rolls all four of his bocce balls, he moves to the area of the played balls, stands outside the court, and waits for the end of the frame. When the frame ends Dr. Cordano ends up with two points as he had two balls closer to the pallino than the closest ball of Polantz. Dr. C gets to roll the pallino in the next frame and play the first ball.